As South Florida’s premier full-service sign company, Stellar Signs & Graphics is very fortunate to be able to develop business relationships with a limitless number of companies. There is no business type that can’t benefit from impressive signage. And, as a result, our team of signage experts has had the pleasure and privilege to work with some of the finest companies in our state. RevitalIV is one of the most unique and innovative brands we’ve ever come across! The wellness clinic provides an incredible service that you may not even be aware exists. 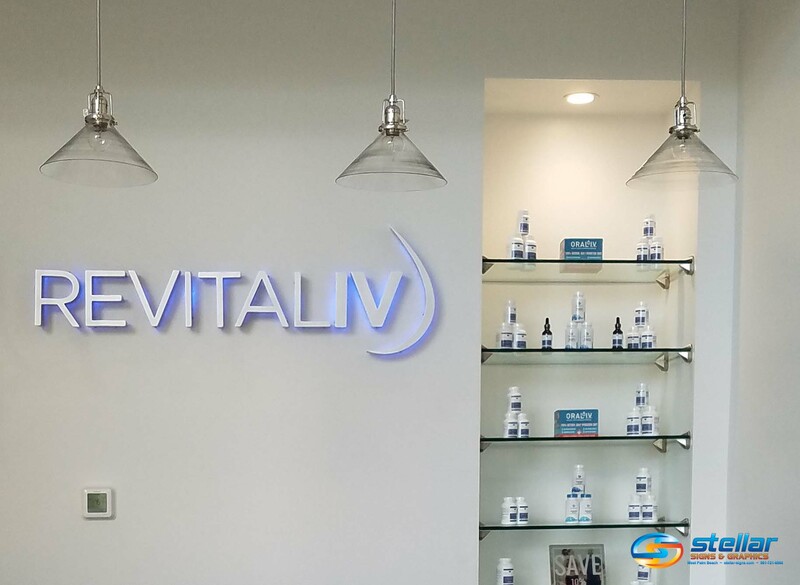 Pronounced how it is spelled (“IV” refers to “intravenous” therapy and not the Roman numeral for “4”), RevitalIV revitalizes its clients by offering hydration therapy. Administered by experienced, board-certified physicians and registered nurses to ensure both the safety and comfort of their clients, RevitalIV’s hydration therapy treatments provide effective relief of moderate dehydration and vitamin depletion caused by alcohol overconsumption, extreme athletics, jet lag, stress and a number of other causes and illnesses. Back in November of 2017, the Stellar Signs & Graphics team was honored to be called upon to manufacture an elegant lobby sign for the RevitalIV office in Jupiter. As you can see in the photo above, it was created with custom fabricated aluminum reverse channel letters which were painted metallic silver and had clear acrylic backs. They were installed with one-inch stand-offs which allowed for blue LED lights to create a halo glow around each of the letters and the logo. The benefits of illuminating your sign with LED lights cannot be understated! One of the greatest aspects of channel letter signs is that they can be illuminated with LED lights. And, as a result, they can be seen from far-off distances, bringing much greater attention to your place of business. This is why channel letters are such popular choices for storefront signs. Your lobby sign can work just as effectively in impressing visitors of your place of business. 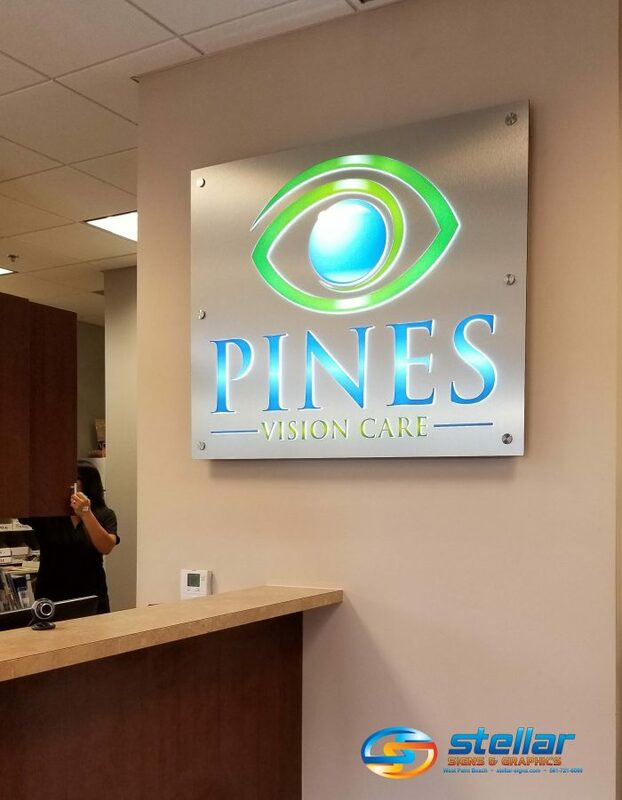 Our friends over at Pines Vision Care know this very well! Contact our team to get us working on your illuminated lobby sign today! The experts at Stellar Signs & Graphics serve the business communities in and around Palm Beach County, West Palm Beach, Royal Palm Beach, Wellington, Lake Worth, Boynton Beach, and Greenacres, Florida. Please don’t hesitate to give us a call at 561-721-6060.